The Battle of Bailen, which resulted in the surrounding and surrender of General Dupont and 13 000 troops, is considered the first significant loss by the French army during the Napoleonic Wars. 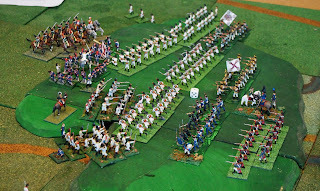 It “caused a sensation throughout Europe, and its repercussions, together with Junot’s defeat at Vimeiro persuaded Napoleon of the need for his personal intervention in the Peninsula’ (Chandler 1979). 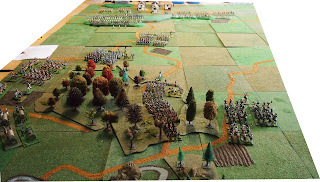 I put together our scenario of the battle in September 2010, but we did not play it until May 2012. 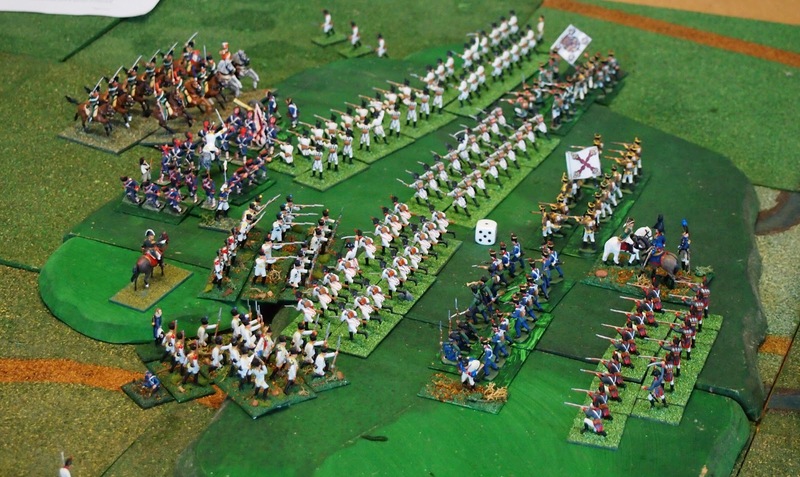 The forces present were determined based on a conversion of 600–800 soldiers present per battalion on the tabletop and 400–600 troopers per cavalry unit on the tabletop. The game lasts for fourteen, thirty-minute turns (07:30–14:00). 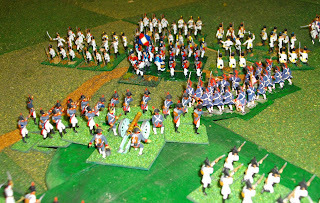 The game ends at the end of the 14:00 turn, or if the French army exits the table, or if all of the divisions of one side or the other are broken. 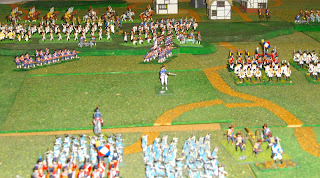 Victory points are awarded to each side at the conclusion of the battle. The Spanish side receives two victory points for each broken French “division” and four points if the French baggage train is captured. 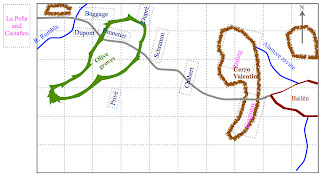 The French side receives two victory points for each unbroken French “division” that exits the eastern edge of the table within 60 cm of Bailén and four points if the French baggage train exits in the same manner. Victory is determined by the differential in the number of victory points for each side. 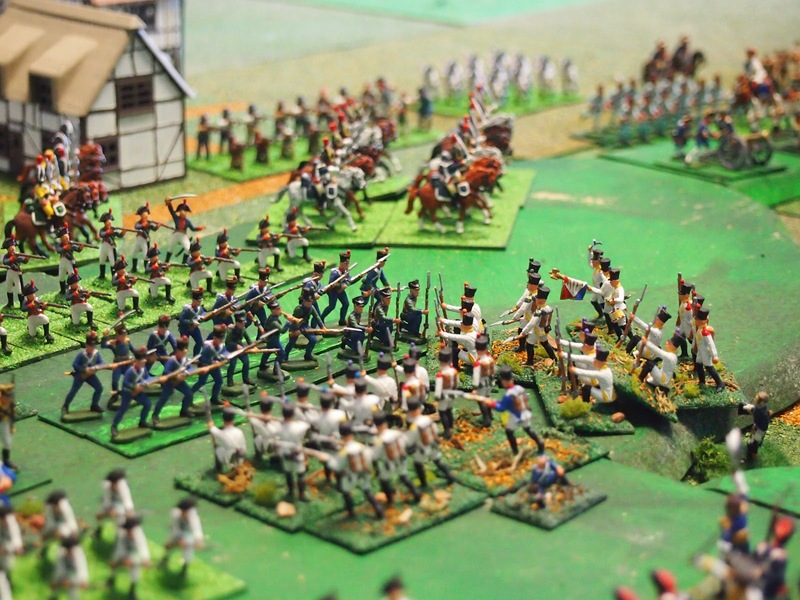 There were Swiss units present on both sides during this battle. As with their historical counterparts, the ‘Spanish-Swiss’ troops of Schramm's brigade of Dupont’s army will surrender to the Spanish on a modified die roll of ‘0’ if within 22.5 cm (9”) of any Spanish infantry unit. 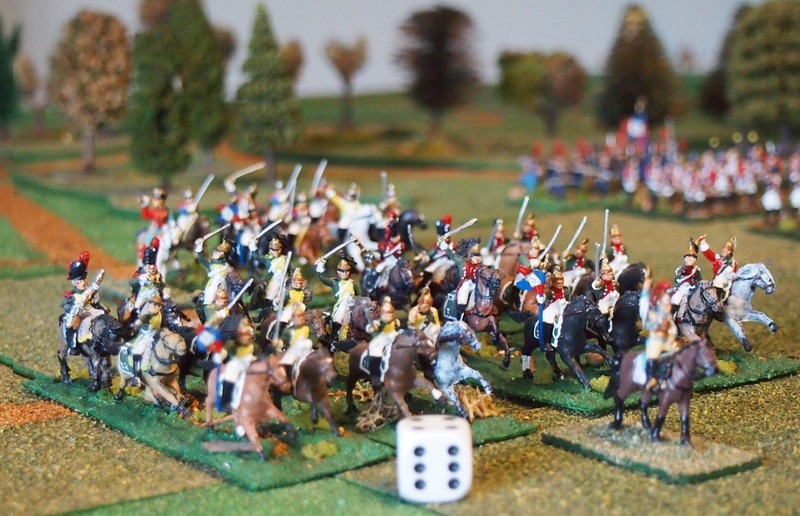 The die roll is reduced by one for each kill suffered by the infantry units of Schramm’s brigade (only). We played the game twice, firstly using the Polemos General de Division rules and the second time using Shako_ANF. In both battles Julian and I took the French and Mark the Spanish. We randomly allocated the quality of generals by dice rolls. Spanish: Reding decisive, Coupigny and La Peña plodding. French: Schramm capable, Chabert decisive, Pannetier decisive, Dupré capable, Privé capable. The eastern end of the table looking north along the Cerro Valentin with Coupigny's division in foreground and Reding's in the distance. Bailén is at right. Looking west from the Spanish position, Bailén in the foreground, French army in the distance. From the western end of the table, French baggage just visible at left-hand foreground, with Dupré's light cavalry ahead of it. Trees in centre (representing the olive grove!) with Pannetier moving through and Privé to the right. 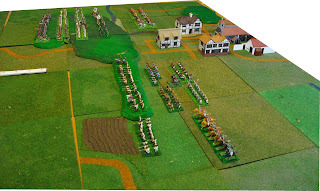 In the distance Schramm and Chabert are in position to attack the Spanish. 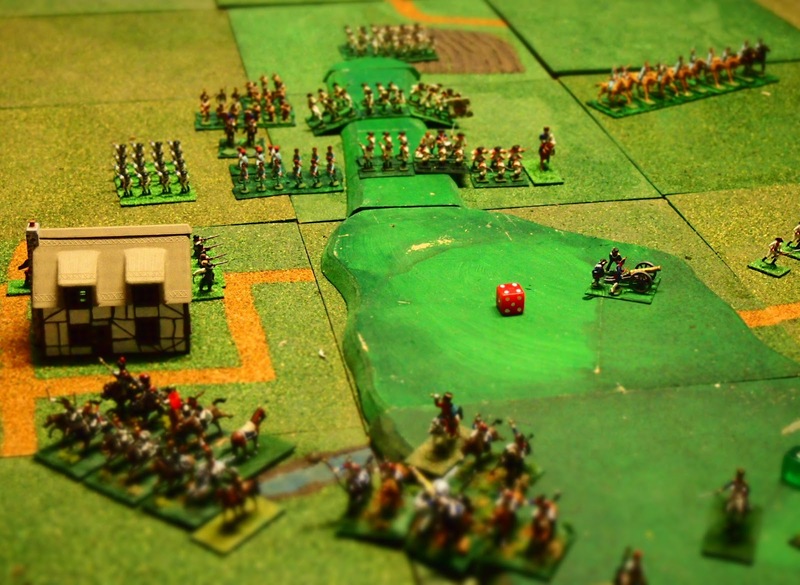 Turn 1 (07:30): Schramm's artillery bombarded Reding's Spanish, resulting in a ceasefire (good old GdD!). 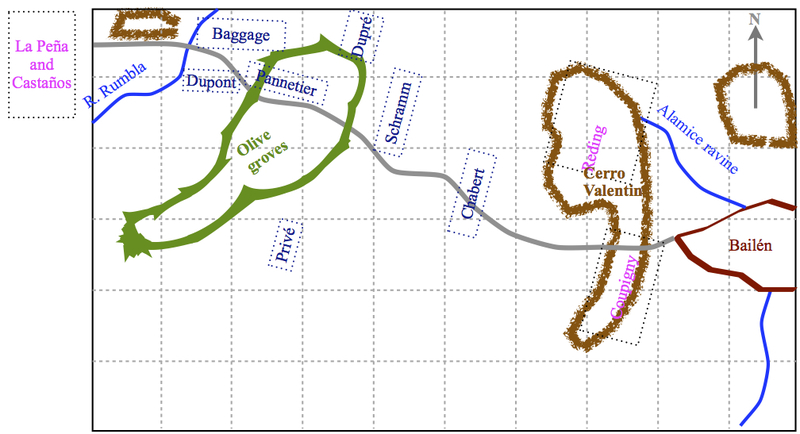 Chabert's division advanced towards Reding's position on the Cerro Valentin. Reding's battery successfully bombarded one of the Swiss units of Schramm's brigade and forced it back 1 BD. 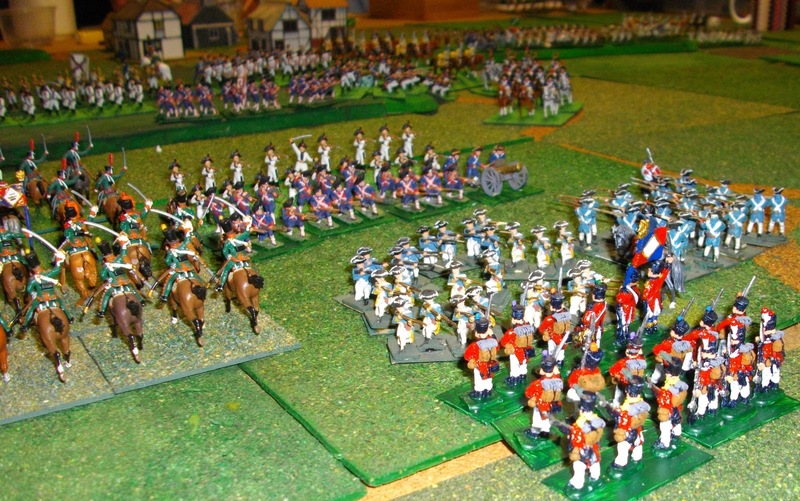 Reding's infantry moved to threaten Chabert's flank. 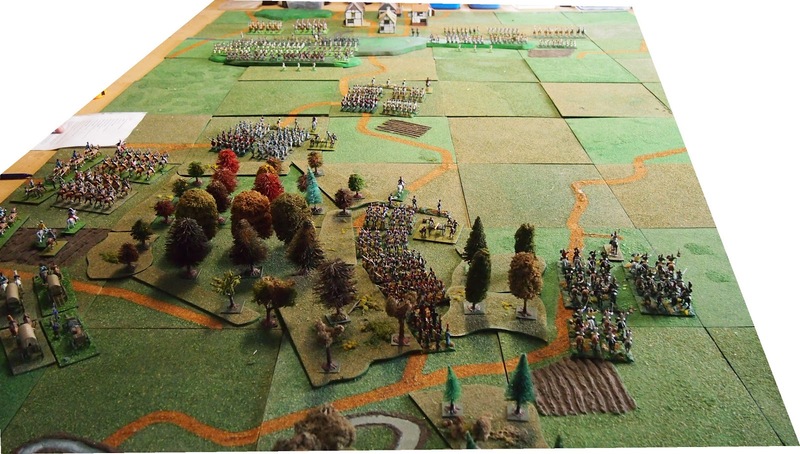 Turn 2, 08:00: Chabert's units moved towards Reding's line and fired at no effect. Reding's gun bombarded the 4th Swiss and got a cease fire result. 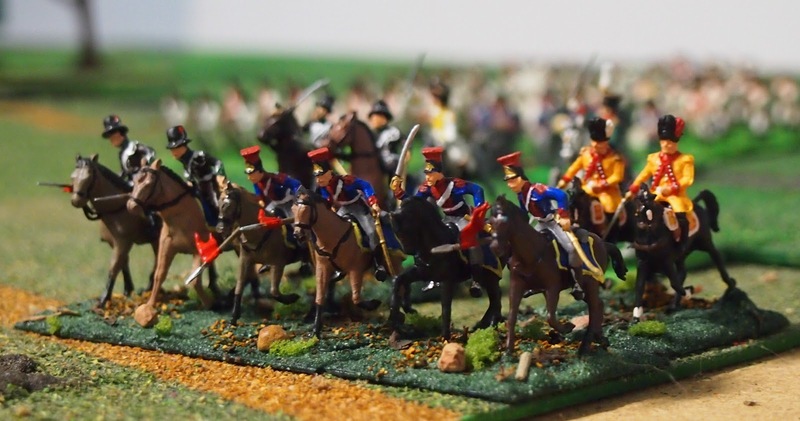 Reding's Walloon and Swiss charged a battalion of Chabert's 4th Reserve Infantry and the 4th Swiss respectively. The Swiss were pushed back and the 4th Reserve Infantry broken. 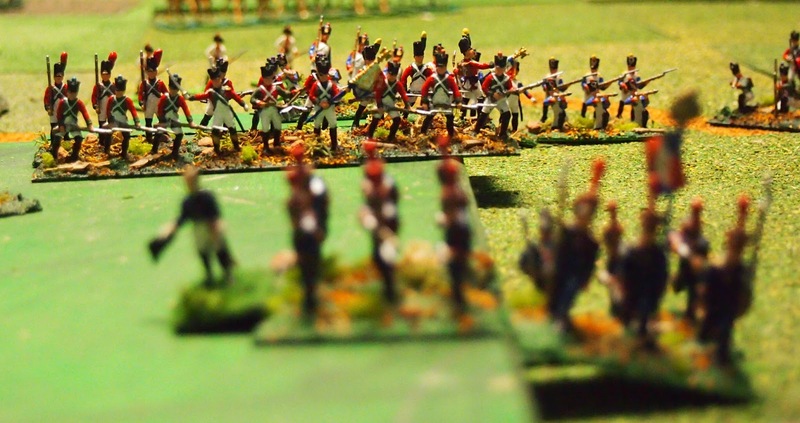 Chabert's brigade failed morale, spent and began to retreat! 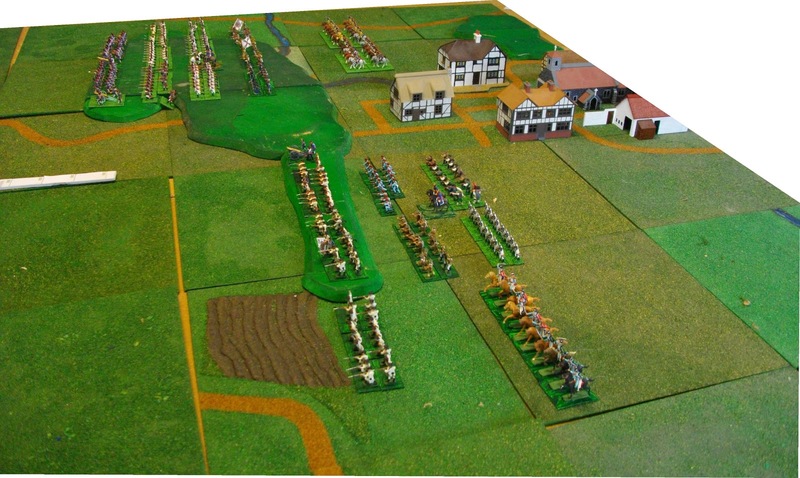 Turn 3, 08:30: Dupré's light cavalry moved in support of Schramm's brigade. 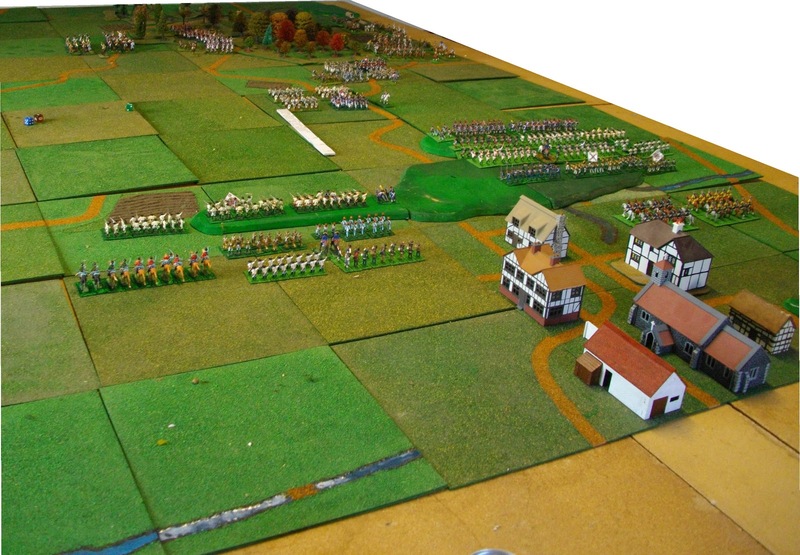 Reding's division attacked Schramm's lead units and pushed them back. 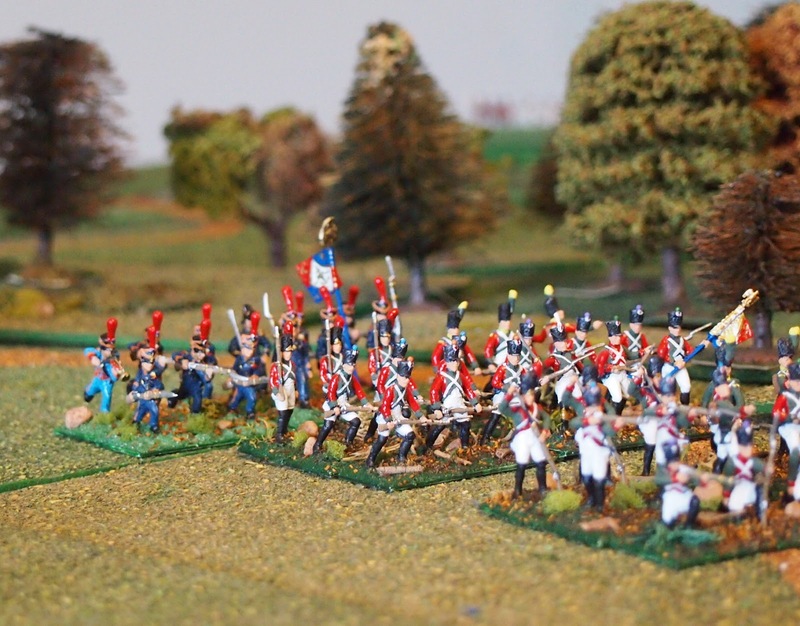 Turn 4, 09:00: Dupré's chasseurs charged and broke unit of Spanish line. 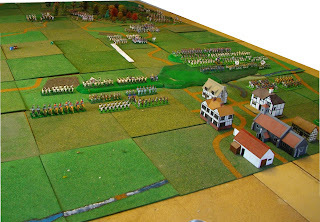 Schramm's Swiss charged the Walloon's and broke! 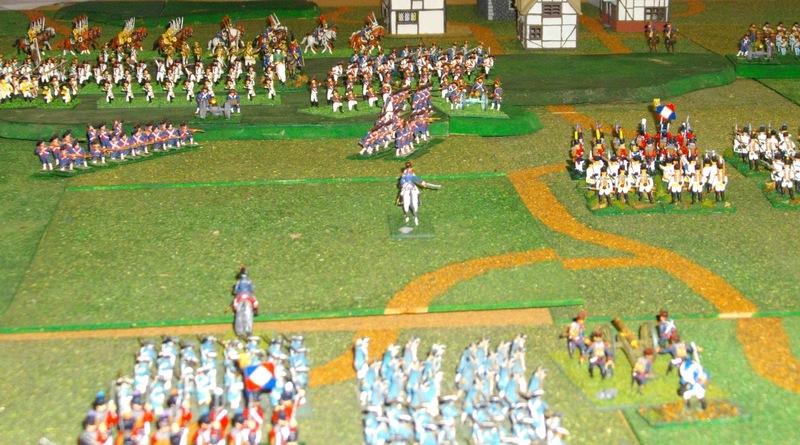 The Walloon Guard, supported by artillery, then attacked next unit of Schramm's brigade and broke it. Schramm's brigade was spent. Spanish hussars with nocturnal mascot! Turn 5, 09:30: Tempo won by the Spaniards. Reding's infantry fired and caused a shaken level on chasseurs. 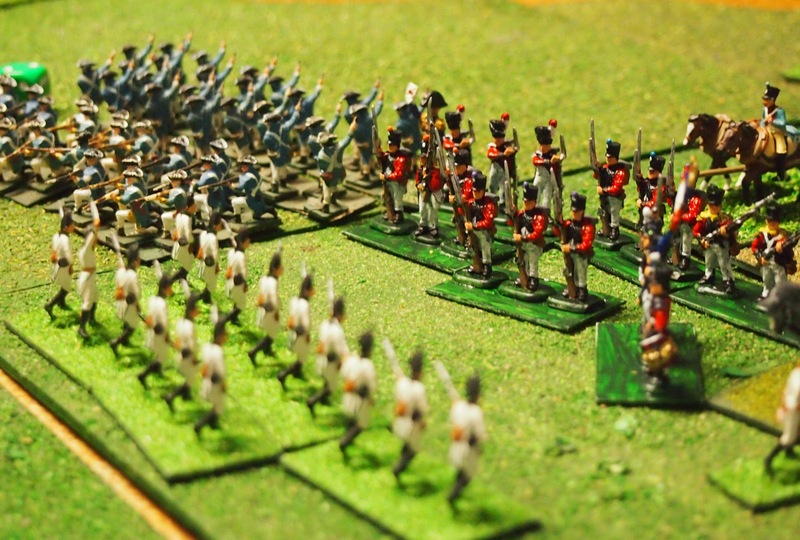 The French removed the shaken level in their tempo and charged Reding's 'line' infantry who formed square. The chasseurs were forced back with two shaken levels (supporting unit were pushed back too). 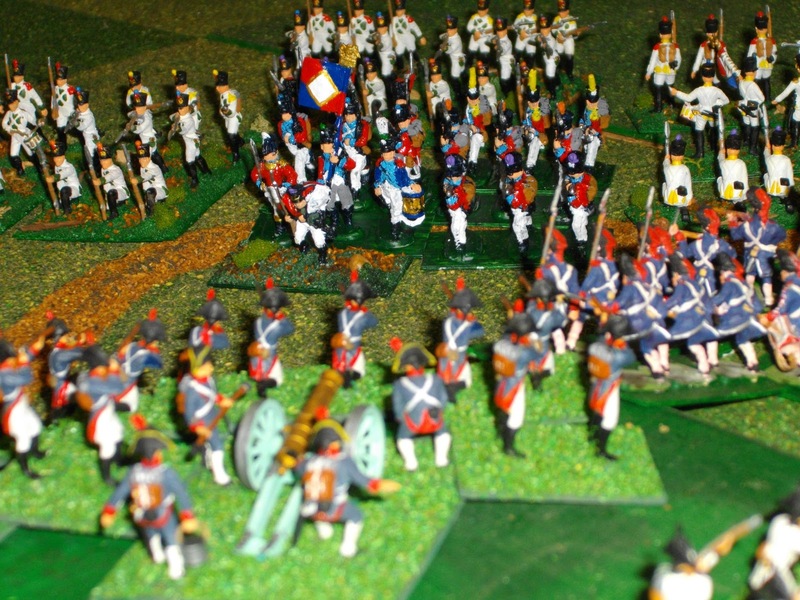 Pannetier's and Privé's troops moved up but too late to become involved in the battle. The set-up; as for version one. 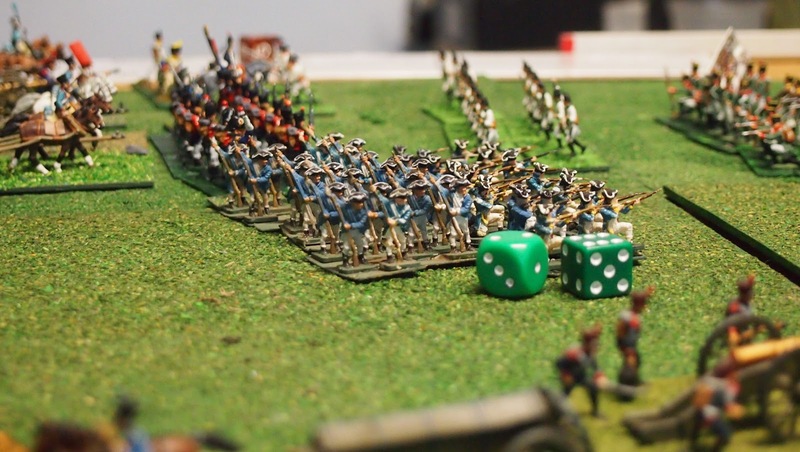 Turn 1, 07:30: Reding's artillery fired at the attacking French with mixed results and Chabert's division began its attack on Cerro Valentino. 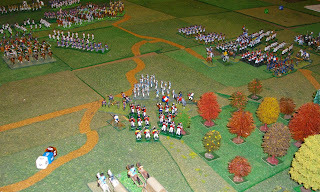 Dupont sent orders to Dupré and Schramm to support the attack, the aide reaching the former (for turn 2). Turn 2, 08:00: Chabert's infantry overran Reding's artillery. Meanwhile orders were received by Pannetier and Schramm to support the attack. Turn 3 08:30: Chabert's brigade continued its attack on Reding's position on the Cerro Valentino. allowing the 4th Swiss to attack and break one of the Walloon's squares. 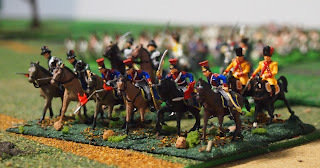 However, the 1/4th Reserve Infantry from Chabert's brigade failed against Spanish Reyna regiment. Dupré's 1st Provisional Chasseurs broke against the square of the Walloon Guard, but his brigade passed the morale test at 50%—phew! 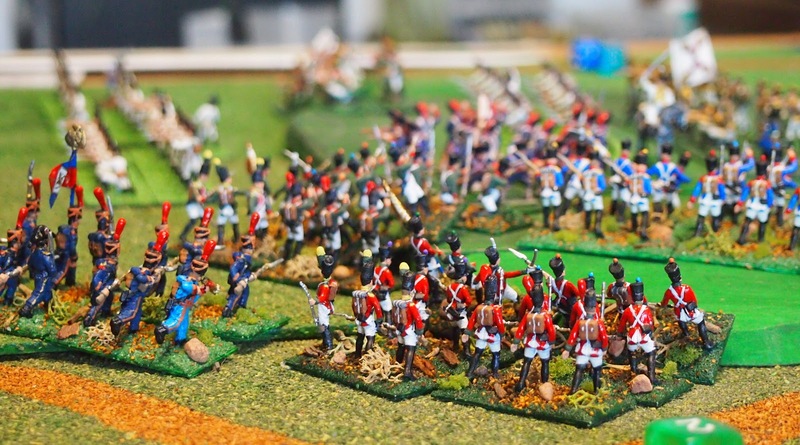 Turn 4: 09:00: The 4th Swiss broke the square of the Spanish Corona regiment. The 2nd Provisional Chasseurs tried their luck against the Walloon square; they retreated, but were not broken. 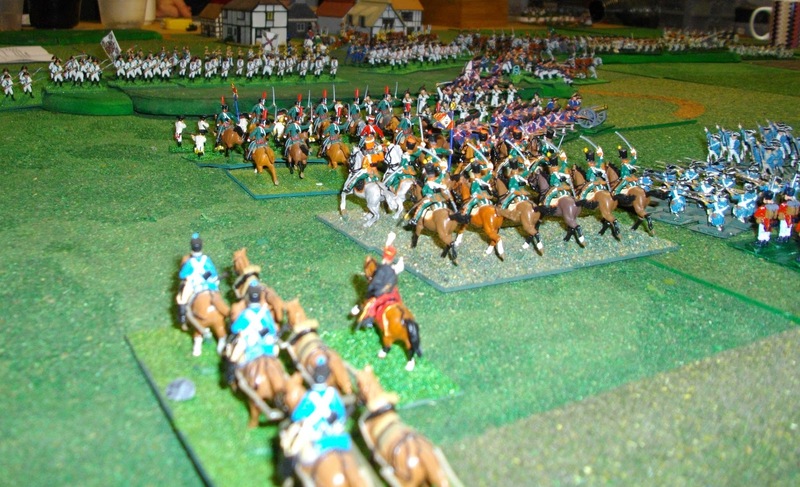 A close-up view of the action on the Cerro Valentin. 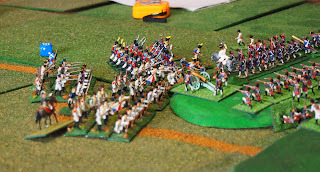 Another view of the combat on Cerro Valentin. 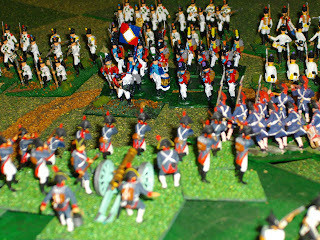 and the Garde de Paris and Garde Marins of Pannetier's brigade approach the ridge. 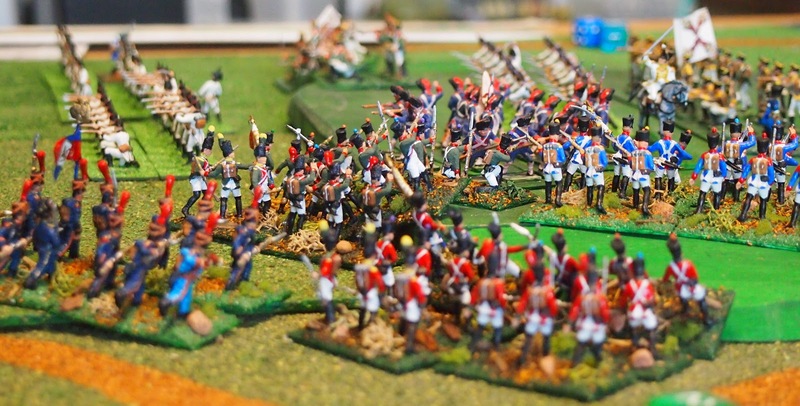 The 2/4th Reserve Infantry from Chabert's brigade attacked the second line of Reding's position and forced back the Spanish 3rd Swiss infantry in Reding's brigade. 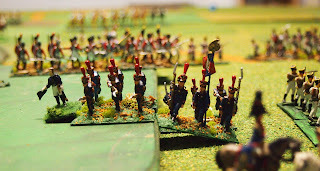 The 4th Swiss (French) were broken after taking further casualties... from skirmisher fire! and broke them. 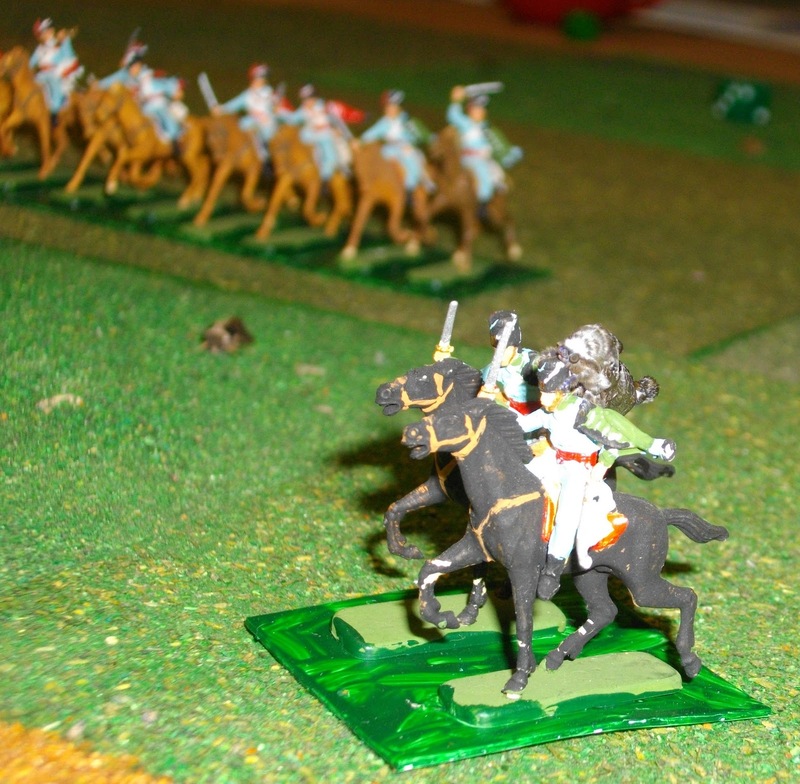 The 2nd Provisional Chasseurs overran Reding's horse gun, then rallied back into line. 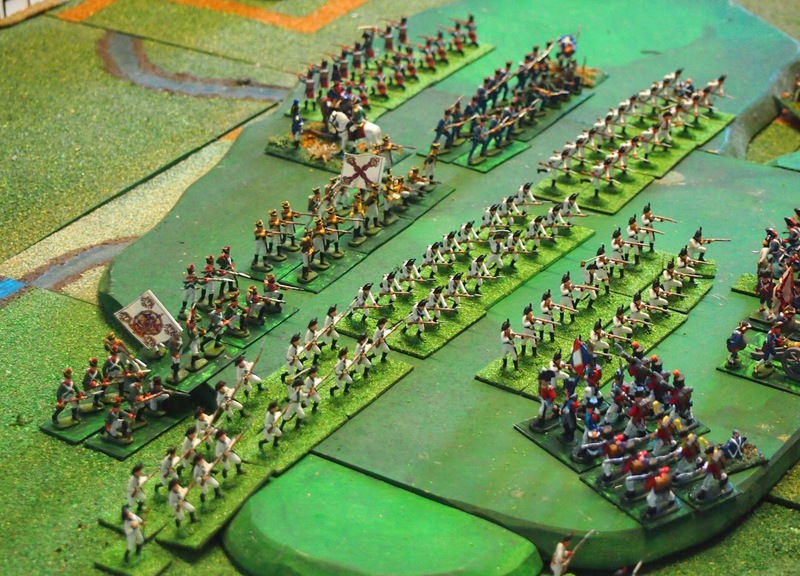 Piré's cavalry and Pannetier's infantry come within striking distance. Piré's 1st Provisional Dragoons fought off the first combined unit of Spanish line cavalry from Reding's brigade, then attacked and routed the Spanish combined dragoons with its breakthrough move. Turn 6 10:00: The remaining battalions of the 4th Reserve Infantry of Chabert's brigade attacked Reding's Spanish 3rd Swiss infantry, one French battalion was broken by the defender's volley, while the other was stopped in its tracks. Turn 7: 10:30: The last battalion of Chabert's 4th Reserve Infantry was broken by a volley from the Spanish 3rd Swiss infantry of Reding's brigade (no photo). 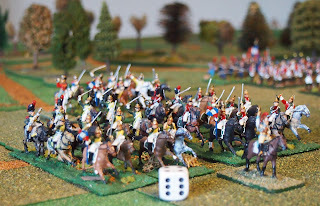 Turn 8 11:00: Reding's brigade counter-attacked towards Schramm's Swiss (seen out of focus in distance) as Pannetier's brigade attacked the Spanish position. 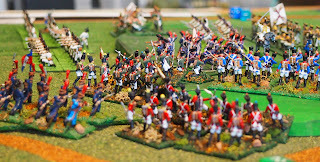 was pushed back by the square of the Walloon Guards. 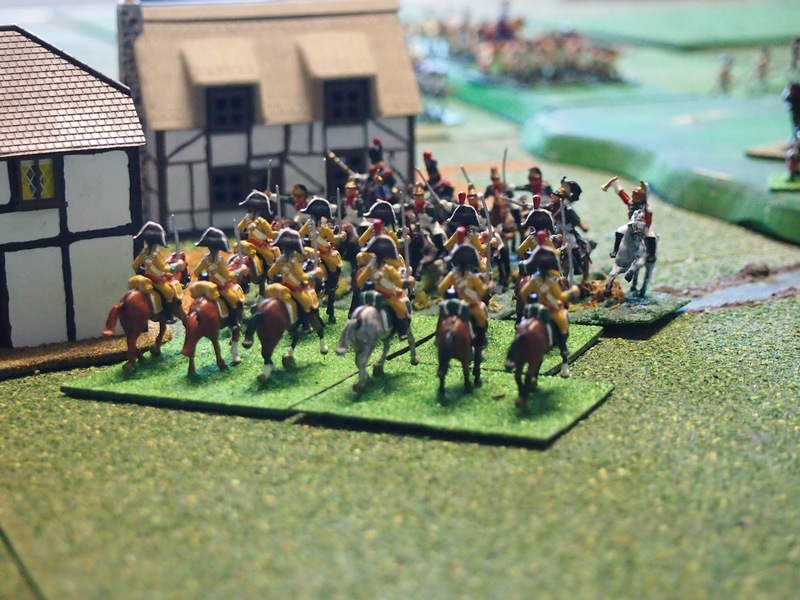 Piré's cuirassiers broke the 3rd Swiss infantry in Reding's brigade. 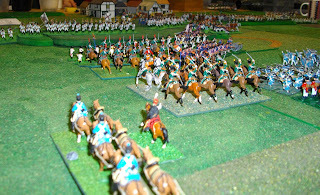 Piré's dragoons charged Reding's combined Spanish dragoons and pushed them back. 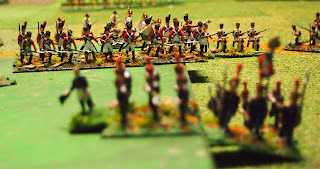 Turn 9 11:30: The Jaen regiment from Reding's brigade (brown coats three photos above) was broken by artillery fire from Dupont's corps artillery (no photo). 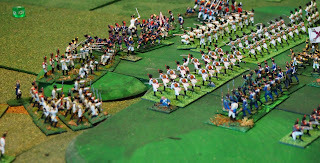 Turn 10 12:00: The last Walloon battalion was broken by 2/Garde de Paris supported by the Garde Marins (no photo). 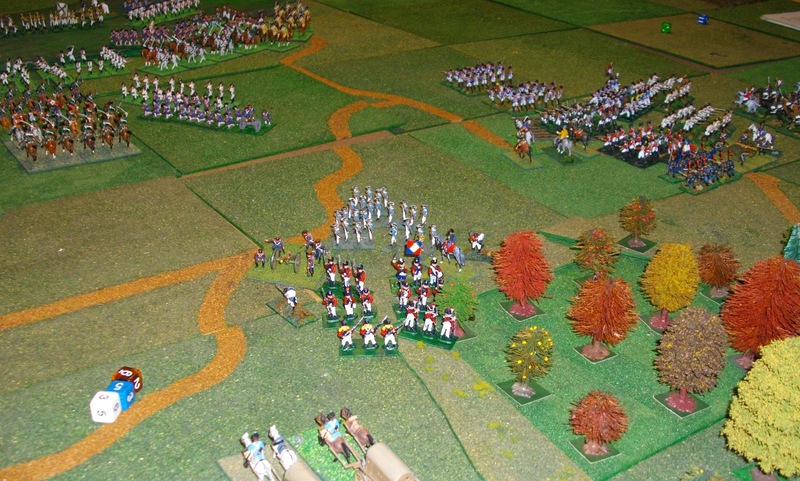 Piré's 2nd Provisional Dragoons charged a square of Coupigny's division and retreated. 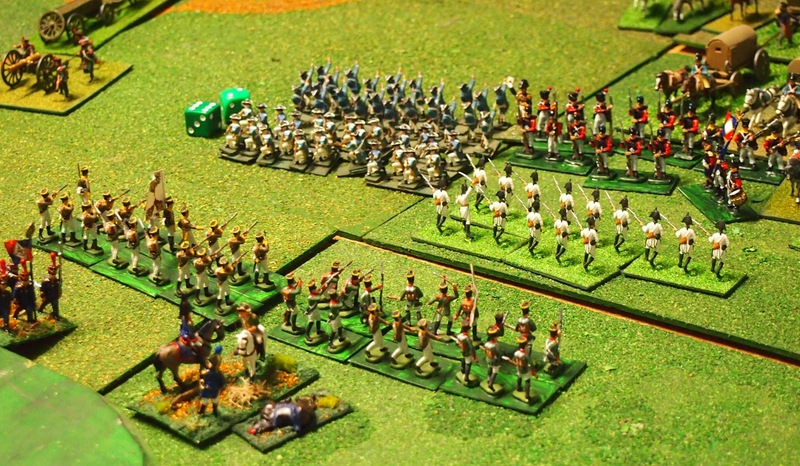 From the west, La Peña's troops arrived in the command phase! The Cerro Valentin at game's end. Schramm's Swiss changed sides as the French baggage came up. and the 1/Garde de Paris and 2/3rd Reserve Legion. 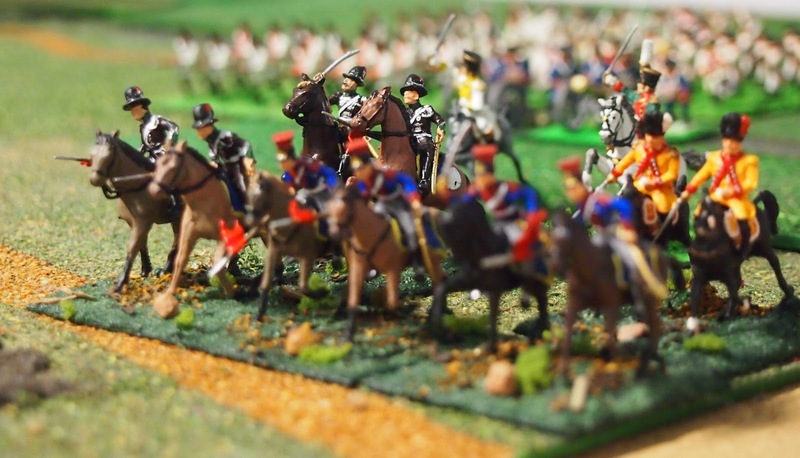 La Peña's Pavia dragoons and Jerez lancers and infantry (in background) arriving to encircle Dupont's troops. Another Spanish victory. Viva Espana! As expected, this was a tough gig for the French player, irrespective of the rules used, but it was by no means a certainty for the Spanish player. The best hope for the French is to win it early. 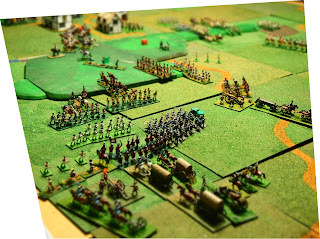 The second version enabled us to drive hard at Reding's defences and, as the closing photos show, thanks to Chabert's brigade and then the support of Pannetier and Piré's cavalry, his position on the Cerro Valentin had been driven through. 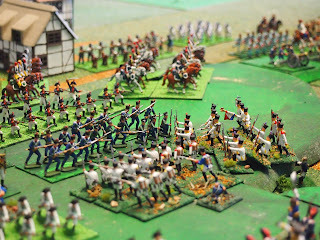 This was not enough though as the 'net' of Coupigny's and La Peña's troops was closing around the French when the Schramm's Swiss decided not to continue the fight against their brothers. 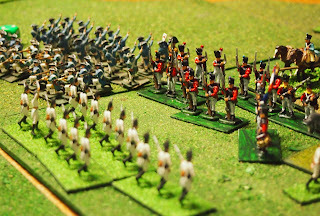 Chandler DG (1979) Dictionary of the Napoleonic Wars. MacMillan Publishing Co., New York. p. 39. Playtest? Isn't that what the players are doing? A challenge for the French player for sure... but up to now the French have been advantaged in most battles, so turn about is fair play! 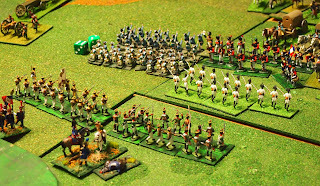 You mentioned in your previous post that playing this Bailen scenario with General de Division pretty much clarified that those rules were not really to your liking. Care to comment on what specifically from this battle lead to that conclusion, James? 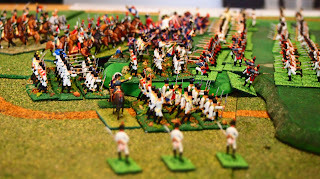 It's basically as I outlined in the review of the rules Peter; although I appreciate that that was somewhat in 'code' regarding the specifics from this battle. So, in brief, here are the reasons generally and specifically related to this game as to why we decided that GdD were not for us. • The tempo system is innovative, but pip-based approaches to managing command and control/time are not our favourite method. That said, we would have lived with it had other aspects been okay. The main reasons are the mechanics of game play. • You'll note that the version of this game with GdD only ran for 5 of a possible 14 turns. This is indicative of the 'fast play' element that has units easily becoming spent leading to brigades/divisions rapidly becoming spent. There is little chance of recovery for units, so almost zero ebb and flow of combat—it is all or nothing. Far more like Blackpowder than Shako and certainly not like General de Brigade. This is despite the rules being specifically corps-level. I reckon it is because with 6 mm figures you don't want to mess about too much, but we prefer a bit more slow wearing of units. • The artillery bombardment rules were ineffectual and bizarre. I commented on that in the review of the rules. • The combat system intertwines firing and mêlée, including supporting artillery and it added to the overall feel that they gave the feel of 18th C warfare rather than Napoleonics. 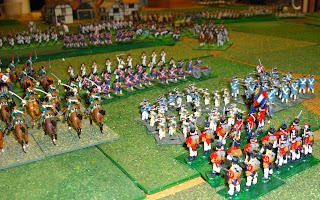 As I mentioned in the review, the Great Northern War rules from the same 'stable' look like a goer to us. Thanks Phil. I thought that you'd pick up on that one!